Don’t know what Shakshuka is? You should! It’s a tomato dish hailing from North Africa, although in present day most associated with the Middle East, where many countries have their own take on it. 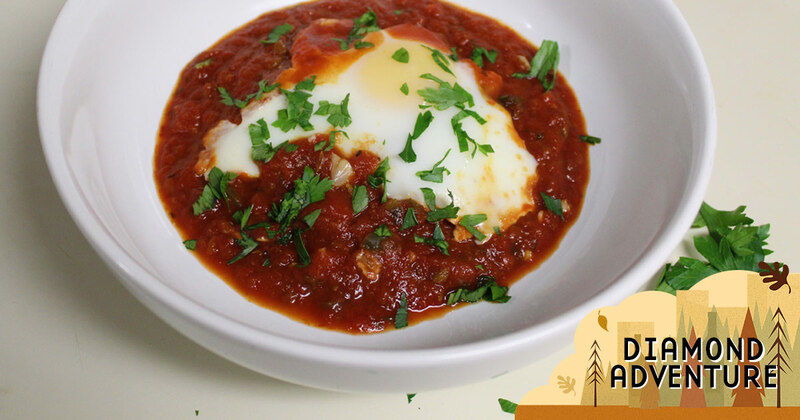 Shakshuka is essentially a sauce of tomato, onion and chili with poached eggs. In Tunisia, they add artichoke hearts and potatoes, In Yemen, it’s served with a spicy hot sauce. Some people add feta, some people add fresh red peppers. In my house, I add fennel, both fresh hot peppers and crushed red pepper and a little parsley at the end as a refresher. I use canned tomatoes, but if you are lucky enough to have an excess of fresh tomatoes from the farmers market, you can use those too (just process them up in the food processor and move forward as if you were using canned crushed tomatoes). It’s one of those dishes that is much better when you make it your own! I happen to love that it takes some of the simplest ingredients and makes them into something incredibly interesting! All in all, it’s pretty much a super food, especially when paired with a nice, velvety red wine like our Diamond Collection Cabernet Sauvignon. Enjoy this while yelling out the questions to Jeopardy or catching up on your favorite podcast. In a large saucepan, sauté garlic, onion and jalapeño with olive oil and a pinch of salt until the onion is translucent. Add your tomatoes and dry spices to the pan and mix. Let the tomato mixture start bubbling, then turn down to med-low heat to encourage a simmer for 20 minutes, stirring occasionally. Serve the tomato base with an egg (or two!) and some fresh parsley to brighten it up just a bit. Shakshuka is a perfect meal for a weekday night in the weeks where summer turns into fall. These are some favorite tunes (including some pretty epic covers) to enjoy when the days are hot, but the leaves start turning.